One of my favorite things to shoot is creative sports portraits, especially when I can get outside of the box and do something unique. 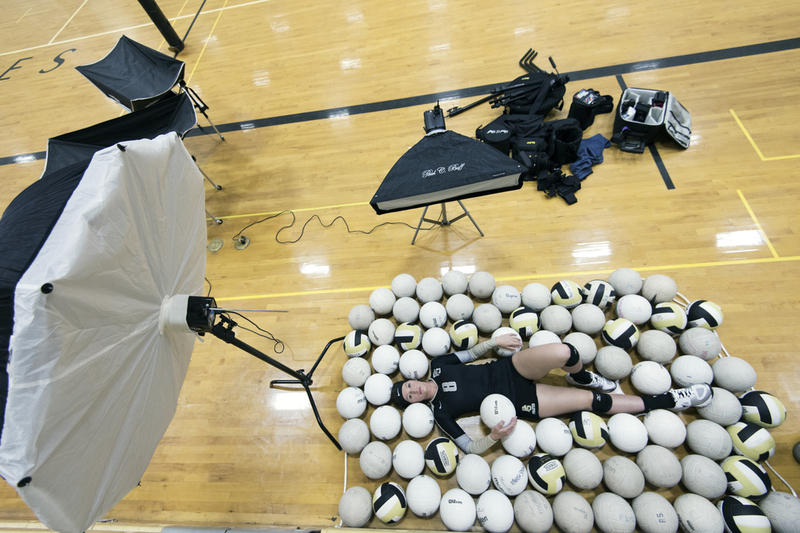 That just happened to be the case when I was asked to do a photo of an All-State volleyball player. I went into the shoot with a few different ideas just in case she wasn't up for the idea I had in mind or if there weren't enough volleyballs or an area to make it happen. Luckily for me she was up for the idea and patient while I figured out how to create it in the high school gym. In the end, the overall setup wasn't too complicated. I ended up standing on top of some of the bleachers that had been collapsed into the wall and shooting down on here since I didn't have my boom arm with me at the time. We found every volleyball in the school and place them around the player and they were held in place by a simple outline of nylon rope on the floor. The lighting setup was also fairly simple. The key light was a small stripbox set as low as I could to the ground and angled slightly down towards the player. I added a 60" softlighter towards the top of the frame as a fill light to open up the shadows on her face that were created by the strip bank. Without it the image was very dramatic but not what I had envisioned. Once we finished with that set up we quickly tried a multiple exposure shot but I quickly decided to move on because I wasn't going to be able to execute my vision in the short time that we had left. I re-positioned a few lights and took some "safe" shots that look more like what you'll see if you were to search for "Volleyball Portrait" online. Those shots consisted of the same 60" softlight as the keylight, camera right, and the stripbox as a kicker, camera left. I added a third light at the back of the gym on a VAL to light up the pirate mascot painted on the wall to add some personality and uniqueness to the portrait.